So don’t forget to bookmark this spot and come back between 9PM – 10PM ET! 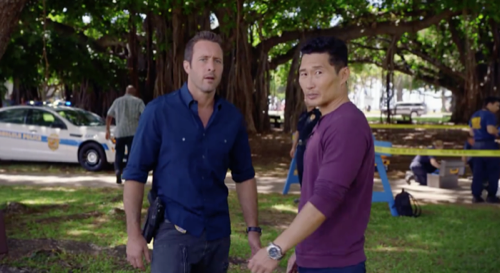 for our Hawaii Five-0 recap. While you wait for the recap don’t forget to check all our Hawaii Five-0 recaps, news, spoilers & more, right here! Jerry usually has a conspiracy theory up his sleeve however he might not be too far off base about what happened to Susie Freeling. Susie had apparently been a friend of Jerry’s. They had met one of those conspiracy websites and they often talked about JFK’s assassination. So Jerry had invited Susie out to Hawaii because many believe that the call made to assassinate Kennedy came from a hotel there and so Susie ended up having a lot of fun on the Island. She said that she got to see the sights and that she even found evidence for them to finally prove their theory that Kennedy’s death had been an inside job. But before Susie got the chance to tell Jerry what she found, she was killed. Someone that was possibly a sniper had shot and killed her instantly. So Jerry naturally thought that his friend had been killed by someone wanting to cover up what she found yet none of Jerry’s friends on Five-0 were really buying his theory. They’ve heard several different theories that Jerry has and no one ever paid any credence to them. However, Jerry said it was different this time and that he could prove this theory. Jerry had said that he and Susie found out that several key members of Kennedy’s cabinet had been the ones that arranged his death and that they had done so because Kennedy had been too light on communism. Jerry said that Kennedy believed in diplomacy over aggression and that the others all thought an attack would actually make them appear stronger. So Jerry detailed what the cabinet had wanted to be done. He said that they wanted to attack Cuba, invade Vietnam, and bomb Russia without any kid of provocation and that way they could triumph over communism. Yet, what seemingly sealed the theory for Susie as well as for Jerry had been the fact the same members that didn’t agree with Kennedy were all on a flight to Asia after spending two days in a conference room without any interruption. And so Susie finding witnesses to the events in Hawaii was the icing on the cake. Susie had talked to a waiter from that time that had remembered a conversation at the hotel that he wasn’t supposed to be listening to and he said that G-Men that he saw had been talking about an upcoming operation. So the second witness had only confirmed that. The second witness had also worked at the hotel and he had been asked if there was any for someone to get a protected service line. But naturally, Five-0 hadn’t thought much of what Susie found. The guys had never heard about the conference with the cabinet members and they thought that there could be a good reason to explain everything else though Kelly wasn’t so sure about that. Kelly had taken everything with a grain of salt at first and then he started to notice that they were being followed. Kelly noticed that same old guy kept cropping up whenever he was checking on Susie’s contacts with Jerry. So he had called out to the man and had tried to follow him when he began running away however the man eventually came to them when he least suspected. Drake had apparently come forward because Susie had somehow gotten his name and so Drake explained that he pretty good at decrypting code. Though what Drake told them next was what really grabbed their interest. Drake had said that he was Hoover’s guy on the Island back in the day and that the message Susie had asked him to decrypt had really been about himself. Someone in the cabinet had apparently found out that the FBI had a man on the island so they warned their friends to be careful. So Jerry and Kelly asked Drake if the cabinet members had been careful and Drake said that they had no reason to suspect him or be careful. Drake’s cover back then had been a manager at the nightclub that everyone wanted to get into and so Drake was never considered to a be a threat yet he was and he also had help. Drake said that there was a singer at the club that was also part of the job and that guys like the ones he seen had no problem with talking around her so she sat herself down at the cabinet members table and no one had a problem with that. However, Kamele’s job was to record the conversations and she did that with her cigarette lighter. Kamele though had died some months back and so there only chance at figuring what she found had been found to find her recorder. But Kamele had moved around a lot and so it had taken them some time to find her possessions and Jerry still hadn’t been happy when they found the cigarette case. Jerry had said that the case proved that the FBI knew about the assassination beforehand and that he didn’t know why they did it. So McGarrett did him a favor and had tried asking. The FBI had unfortunately been sneaking around Susie’s death and collecting evidence. And so McGarrett decided to go up to their car. The funny thing about that however was that the FBI were not part of the conspiracy. The FBI had apparently been in contact with Susie about a chemical company that were risking lives and so they had asked Susie to keep quiet while they investigated. Yet, Susie died because the company thought she might go public with what she knew and so she didn’t die because of Kennedy. Kennedy had actually been just as it seemed with no grander conspiracy and Jerry had to find that out for himself. Jerry had listened to the tapes on the recorder and he had found out that the government were attempting to assassinate Castro as not their president. So Jerry had to content himself with the fact that Five-0 caught Susie’s killer.